Vice Premier Moshe Ya'alon said Thursday that the blast at the Iranian missile facility near Tehran last November hit a system meant to manufacture missiles that could threaten the United States. 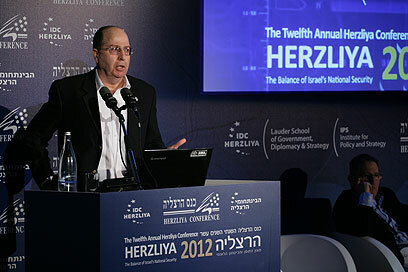 Ya'alon, speaking at the 2012 Herzliya Conference, added that it was possible to carry out military strikes against any of Iran's facilities. "Any facility defended by a human being can be penetrated. Any facility in Iran can be hit, and I speak from experience as the IDF chief of staff," he remarked. Just last week US officials confessed they lacked the ability to destroy fortified nuclear facilities in Iran. However Ya'alon claimed Thursday that "the West has the ability to attack, but as long as Iran isn't convinced about their determination to carry it out – they will continue their manipulations. The Iranians believe this determination is non-existent, as far as a military action and sanctions." The vice premier noted that are a number of ways to put a stop to Iran's nuclear armament, including economic sanctions which he believes might present the Iranian regime with the dilemma either bomb or survival. "We must convince China, Russia and Turkey, which are helping the Iranians bypass the sanctions," Ya'alon asserted. At least 17 Revolutionary Guards were killed in November 2011 in a blast at a nuclear facility near Tehran. Among those killed at the Revolutionary Guards base arsenal in Bidganeh, near the city of Karaj, 25 miles (40 km) outside the capital, was Hassan Tehrani Moqaddam, an officer with a rank equivalent to that of a brigadier general. "Iran has enough nuclear material for four bombs," Director of Military Intelligence Major General Aviv Kochavi warned Thursday. Kochavi made a rare appearance at the 2012 Herzliya Conference, where he reviewed regional changes, the effects of the Arab Spring and the Iranian threat. "Iran is vigorously pursing military nuclear capabilities and today the intelligence community agrees with Israel on that. Iran has over four tons of enriched materials and nearly 100kg of 20% enriched uranium – that's enough for four bombs," he said. See all talkbacks "'All Iranian facilities are vulnerable' "